Dogs and Doorbells -- Oh My!. You know the scene. The dreaded sound of Ding-Dong or Knock-Knock and chaos breaks loose. Toenails are heard scratching up the floor, small children are knocked out of the way, and the ear-piercing sound of Woof-Woof-Woof (or yap, yap, yap depending on the size of your pooch!) fills the household. Peace and tranquility has again been disturbed due to the circumstance of someone showing up at your door. It is frustrating and grates on our nerves, but is it really all that bad that the dog goes ballistic when someone shows up at your front door? If that someone is of ill intent, we are pretty thankful that Fido can alert us or drive the intruder away. The real problem lies in the fact that most of us can't control the dog, even after we've determined that it is just the pizza guy or grandma at the door. Now we're busy trying to grab hold of the collar or herd the leaping dog into another room. It is a scene that might be worthy of a Laurel and Hardy film. There is hope however. It doesn't have to be that way, and a little command called Place can save the day. 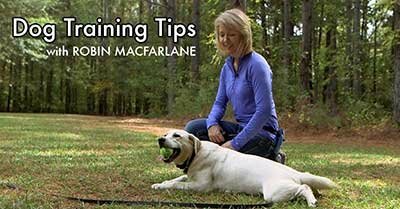 Take a look at what this simple command that teaches a dog to go to a location and stay there can do for maintaining the peace in your household. Next Article: Stop Your Dog from Bolting to the Door! Pull-Quote= Need your dog to stop going bonkers when someone arrives at your door?